When man started to unembody the Incarnation he started to lose the iconicity of the Creation. In losing the iconicity of the Creation and of Christ he was slowly omitting the sacred rituals until he came to believe that there are no sacred rituals anymore and that nothing of the created order is or can be sacred. The man who believes that there are no sacred rituals anymore will very soon realize that his unritualized body is not sacred also, and thus will start preach the soul-only salvation. The unritualized man is the secular man, for that who refuses the sacred in the form of ritual is unavoidably driven towards a secular behaviour, be it a ethicist or pious or puritan behaviour, secular nevertheless. After the Annunciation, God the Son did not become a spirit, but took flesh, He became embodied, receiving full human nature. The central problem of humanity thus is not its lack of spirituality, but its lack of embodied iconicity. We were not supposed to imitate Christ only at the level of His spirit, His mind, but also at the level of his whole humanity which is unavoidably embodied. Just think for a second if one can imagine the development of the same Christian theology as we have now if Christ would have been obese. Or would we have the same theology if Christ was clean shaved? What does it mean to become like Jesus? Does it mean to follow him in our minds and in our ethical behavior, but to run away from His manger into conformable apartments and A-class offices, from the dusty streets of Galilee into our SUV’s, from his heavy cross of Calvary inside the comfort of modernity? Can we really follow half of Jesus, or we either follow the complete God-man or end up not following Him at all? Can we really follow a ritualistic, ascetic and iconic Jesus in a unritualistic, anascetic and aniconic manner? Faithful readers of this blog will have observed that lately I am interested in the theology of the body. In fact most of my posts after the Christmas of 2012 are very „earthly” and „bodily”. It is for a good reason. Thus it follows necessarily that THIS body will be resurrected and reunited with the living soul. This body will be resurrected! This body is the temple of the Holy Spirit. This body belongs to God, along with this soul. My whole being belongs to God, for He created both the soul and the body! My whole being is supposed to be saved in Christ Jesus, God Man embodied! My body is not mine to poison myself with industrial garbage. My body is not mine to indulge myself in all and any uncleanness. Jesus Christ came to save entire me, my soul AND my body. He took human nature including human body. He ascended to Heaven EMBODIED. His flesh and blood is given for the life of the world. The New Jerusalem will not be somewhere in thin air, up in heaven! Our home, the New Jerusalem is descending right now and will land without a doubt here on earth. The earth will be renewed, not re-created! Christ cannot deny Himself, to annihilate creation, because He took body from within THIS creation. The entire creation is restored through the Incarnation of Christ and will fully be restored at the end of ages. I deny and despise and oppose each and any arch-heresy that proclaims the salvation of the soul and the forgetfulness and damnation of the body. I deny and despise and oppose each and any arch-heresy that is anti-Christ! I deny and despise and oppose each and any arch-heresy and false teaching that does not affirm the full Christ! I deny and despise and oppose each and any arch-heresy that does not explicitly teach the salvation of THIS body. I deny and despise and oppose each and any arch-heresy that does not explicitly teach the duality of the Person of Christ, fully God and fully Man, embodied. I deny and despise and oppose each and any arch-heresy that preaches the false Gospel of the Antichrist! I deny and despise and oppose each and any arch-heresy that does not unite the deed of the faith with the faith! I deny and despise and oppose each and any arch-heresy that does not unequivocally affirm WITH PHYSICAL AND BODILY DEED the dual nature of the Risen and Glorious Christ, fully God and fully Man. I deny and despise and oppose each and any arch-heresy that separates and divorces the man in Soul and Body and preaches the salvation of half the man. I deny and despise and oppose each and any arch-heresy that separates The Son from The Father and from The Holy Spirit. I deny and despise and oppose each and any arch-heresy that preaches a personal, made-in-oneself-image stripped-down-Jesus-idol. I deny and despise and oppose each and any arch-heresy that does not teach that Christ Jesus in flesh comes. That heresy and teaching is the Antichrist, and there are many. 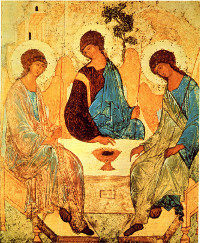 To the blessed Triune God, Almighty Father, Son and Holy Spirit be the glory from age to age, amen! THIS BODY WILL BE RESURRECTED! REDEMPTION INCLUDES THIS BODY ALSO!